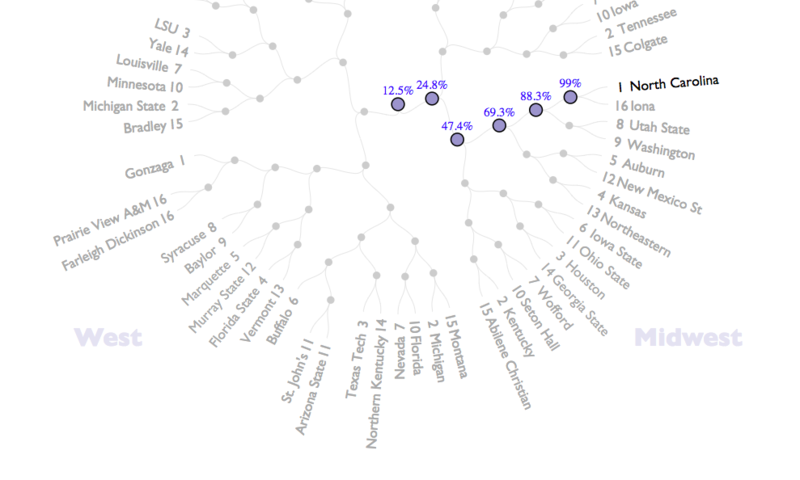 The field of 68 is set, and I’ve used my college basketball team rankings to calculate the win probabilities for each team. In addition, the results gets shown in an interactive data visualization. Hover over a team to get its probability to advance through each round. Hover over a game to see the odds that each team wins that game. You can get the tournament win probabilities by hovering over the center dot. However, sometimes it’s easier to look at these results in a list. Here are the win probabilities for the top 20 teams in 2019. You can use these numbers to apply the contrarian ideas I write about in my book How to Win Your NCAA Tournament Pool. Or, if you don’t have much time, you can let me do the work for you. My full bracket advice optimizes your chances to win your pool. To learn more, click here. To evaluate offense and defense in college football, I look beyond points per game, which can be affected by tempo and turnovers. You can get more insight by looking at an efficiency metric like yards per play. Based on an algorithm I developed, I make schedule adjustments to yards per play to rank college football offense and defense. Below, I show the results for the Big Ten after 7 weeks of the 2018 season. The format below gives rank, team, and rating, or an expected yards per play against an average FBS opponent. This data comes from a small sample size of 7 games at most. These results are noisy, as you would never say too much about a basketball or baseball team after a similar number of games. Wisconsin jumped to the top of the Big Ten with a respectable 5.78 yards per play against Michigan’s top ranked defense. Ohio State has struggled this season, as they most recently allowed 7.07 yards per play to weak a Minnesota offense. I broke down Ohio State’s defense in this week’s podcast The Football Analytics Show. Members get access to adjusted yards per play numbers for all college football teams. It also includes spread predictions for all college football and NFL games. With the college football season only weeks away, you’d like to know how many games your team will win. Analytics can help, as team performance tends to persist from year to year in college football. This makes it possible to use linear regression to predict the 2018 season. My preseason model considers team performance, turnovers and returning starters. To check out the rankings, click here. These rankings gives a predicted point spread in each game, which accounts for home field. This point spread implies a win probability for each team. The sum of these win probabilities give the win totals below. The remainder of this articles gives college football win totals for 130 FBS teams. The first number gives a team’s rank in the preseason rankings. The rating gives an expected margin of victory against an average FBS team (neutral site). 2: Alabama, 19.4 rating, 10.0 wins. 4: Georgia, 18.2 rating, 10.1 wins. 5: Auburn, 17.6 rating, 9.0 wins. 10: Mississippi State, 14.3 rating, 8.6 wins. 21: Texas A&M, 9.0 rating, 6.9 wins. 26: LSU, 7.9 rating, 6.3 wins. 34: Mississippi, 6.9 rating, 6.7 wins. 36: Florida, 6.8 rating, 7.4 wins. 45: South Carolina, 5.2 rating, 6.6 wins. 47: Missouri, 4.6 rating, 6.4 wins. 50: Arkansas, 3.9 rating, 6.2 wins. 59: Kentucky, 1.2 rating, 5.6 wins. 71: Tennessee, -1.9 rating, 5.2 wins. 84: Vanderbilt, -4.0 rating, 4.4 wins. 6: Ohio State, 17.4 rating, 9.6 wins. 8: Wisconsin, 16.0 rating, 9.5 wins. 11: Michigan State, 13.9 rating, 8.9 wins. 12: Michigan, 13.4 rating, 8.0 wins. 15: Penn State, 12.3 rating, 8.3 wins. 19: Iowa, 9.9 rating, 8.1 wins. 32: Northwestern, 7.2 rating, 6.5 wins. 48: Purdue, 4.3 rating, 5.8 wins. 49: Nebraska, 4.0 rating, 5.8 wins. 58: Minnesota, 1.7 rating, 5.9 wins. 68: Maryland, -1.0 rating, 4.7 wins. 74: Indiana, -2.1 rating, 4.6 wins. 83: Rutgers, -3.9 rating, 4.3 wins. 90: Illinois, -5.2 rating, 4.0 wins. 3: Oklahoma, 18.6 rating, 9.8 wins. 14: TCU, 12.9 rating, 8.1 wins. 18: Oklahoma State, 10.1 rating, 7.6 wins. 23: Texas, 8.8 rating, 6.9 wins. 28: Iowa State, 7.6 rating, 6.5 wins. 31: Kansas State, 7.3 rating, 6.5 wins. 38: Baylor, 6.7 rating, 6.5 wins. 39: Texas Tech, 6.5 rating, 6.3 wins. 43: West Virginia, 6.1 rating, 6.1 wins. 93: Kansas, -5.5 rating, 3.2 wins. 1: Clemson, 21.6 rating, 10.4 wins. 17: Miami (FL), 10.4 rating, 8.2 wins. 22: Florida State, 8.9 rating, 6.8 wins. 24: Virginia Tech, 8.8 rating, 7.8 wins. 25: Georgia Tech, 8.3 rating, 6.8 wins. 27: Duke, 7.8 rating, 6.8 wins. 33: Louisville, 6.9 rating, 6.9 wins. 37: Boston College, 6.8 rating, 6.8 wins. 41: Wake Forest, 6.2 rating, 6.6 wins. 46: Pittsburgh, 4.6 rating, 5.5 wins. 51: North Carolina State, 3.3 rating, 6.1 wins. 56: Syracuse, 2.2 rating, 5.7 wins. 63: North Carolina, 0.7 rating, 5.1 wins. 65: Virginia, 0.5 rating, 5.6 wins. 9: Washington, 14.8 rating, 9.1 wins. 13: Stanford, 13.3 rating, 8.4 wins. 20: USC, 9.5 rating, 7.6 wins. 35: Utah, 6.9 rating, 7.1 wins. 40: California, 6.3 rating, 7.3 wins. 42: Oregon, 6.1 rating, 7.5 wins. 44: Arizona, 5.7 rating, 7.6 wins. 53: UCLA, 2.6 rating, 5.1 wins. 54: Arizona State, 2.6 rating, 5.5 wins. 55: Washington State, 2.4 rating, 6.2 wins. 89: Colorado, -5.2 rating, 4.0 wins. 101: Oregon State, -7.5 rating, 3.0 wins. 7: Notre Dame, 16.3 rating, 9.2 wins. 82: Army, -3.9 rating, 7.2 wins. 85: Brigham Young, -4.2 rating, 4.9 wins. 99: Massachusetts, -6.5 rating, 6.2 wins. 105: New Mexico State, -9.5 rating, 6.2 wins. 121: Liberty, -14.7 rating, 4.2 wins. 16: UCF, 10.8 rating, 9.7 wins. 29: Memphis, 7.5 rating, 9.2 wins. 57: South Florida, 2.2 rating, 7.7 wins. 61: Houston, 1.1 rating, 7.2 wins. 62: Navy, 0.9 rating, 7.5 wins. 75: Temple, -2.2 rating, 6.2 wins. 78: SMU, -2.8 rating, 5.5 wins. 81: Tulsa, -3.8 rating, 5.3 wins. 91: Tulane, -5.3 rating, 4.9 wins. 100: Cincinnati, -6.5 rating, 5.3 wins. 107: East Carolina, -10.0 rating, 4.1 wins. 119: Connecticut, -13.5 rating, 3.0 wins. 30: Boise State, 7.3 rating, 9.2 wins. 64: San Diego State, 0.5 rating, 7.8 wins. 66: Fresno State, -0.0 rating, 7.4 wins. 72: Utah State, -2.0 rating, 7.3 wins. 77: Wyoming, -2.4 rating, 6.7 wins. 88: Colorado State, -4.7 rating, 6.1 wins. 92: Air Force, -5.3 rating, 5.5 wins. 104: Nevada, -8.8 rating, 5.2 wins. 108: UNLV, -10.0 rating, 5.6 wins. 110: New Mexico, -10.5 rating, 4.3 wins. 122: San Jose State, -15.1 rating, 3.4 wins. 125: Hawaii, -16.0 rating, 4.0 wins. 67: Toledo, -0.6 rating, 8.2 wins. 76: Northern Illinois, -2.2 rating, 6.2 wins. 79: Ohio, -3.2 rating, 7.7 wins. 86: Western Michigan, -4.4 rating, 6.8 wins. 94: Buffalo, -5.7 rating, 6.8 wins. 98: Miami (OH), -6.4 rating, 6.0 wins. 102: Eastern Michigan, -7.9 rating, 5.8 wins. 103: Central Michigan, -8.6 rating, 5.3 wins. 106: Akron, -9.7 rating, 4.9 wins. 115: Bowling Green, -12.2 rating, 4.1 wins. 127: Ball State, -16.8 rating, 3.4 wins. 129: Kent State, -19.8 rating, 2.6 wins. 73: Appalachian State, -2.1 rating, 8.4 wins. 80: Troy, -3.6 rating, 7.5 wins. 87: Louisiana Monroe, -4.5 rating, 6.9 wins. 95: Arkansas State, -5.7 rating, 7.0 wins. 97: Georgia Southern, -6.0 rating, 6.7 wins. 109: South Alabama, -10.2 rating, 5.1 wins. 118: Coastal Carolina, -13.5 rating, 4.5 wins. 120: Georgia State, -13.8 rating, 3.8 wins. 124: Louisiana, -15.8 rating, 3.9 wins. 126: Texas State, -16.6 rating, 4.0 wins. 52: Marshall, 3.0 rating, 8.9 wins. 60: Florida Atlantic, 1.1 rating, 7.5 wins. 69: Louisiana Tech, -1.6 rating, 7.6 wins. 70: Middle Tennessee, -1.7 rating, 7.3 wins. 96: North Texas, -6.0 rating, 7.3 wins. 111: Southern Miss, -10.6 rating, 5.6 wins. 112: Western Kentucky, -10.7 rating, 4.9 wins. 113: UAB, -10.8 rating, 6.1 wins. 114: UTSA, -11.4 rating, 4.8 wins. 116: Florida International, -12.2 rating, 4.9 wins. 117: Old Dominion, -12.6 rating, 4.8 wins. 123: Charlotte, -15.6 rating, 3.8 wins. 128: Rice, -19.5 rating, 3.7 wins. 130: UTEP, -21.5 rating, 2.6 wins. Every morning, I post predictions for Major League Baseball games based on my team rankings and starting pitchers. In early May, the weight of the second factor that uses data from the current season overtakes the preseason numbers. This weight increases with each passing day of the season. For starting pitchers, I use the Zips predictions on Fangraphs. May has usually been a good month for these predictions when look at the win rate of the team with the higher win probability. Let’s compare this with the team favored by the moneyline in the markets. 2016: The Power Rank, 56.8%. Markets, 60.7%. 2017: The Power Rank, 56.7%, Markets 56.2%. The predictions have also been good early this season. From April 9, 2018 through May 8, 2018, The Power Rank has predicted 58.9% of game winners (231-185) compared to 57.8% for the median closing moneyline in the markets. I don’t expect this type of accuracy compared to the markets later in the season. My numbers haven’t given up on teams like the Los Angeles Dodgers. Despite a 15-20 record early this season, the Dodgers are still ranked 9th when I take expected runs and adjust for strength of schedule. The numbers do not account for injuries, so please make the necessary adjustments. To check out the daily baseball predictions, click on the primary predictions page.